Scale a skyscraper to rescue your lost love in The Tower of Druaga. 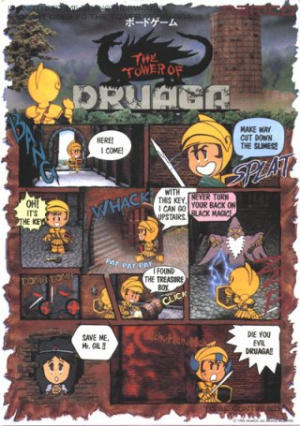 The Tower of Druaga is a moderately infamous arcade game. As the knight Gil (Who is really Gilgamesh) you must work your way up a gigantic 60-floor tower to rescue your beloved princess Ki from the clutches of the evil Druaga. 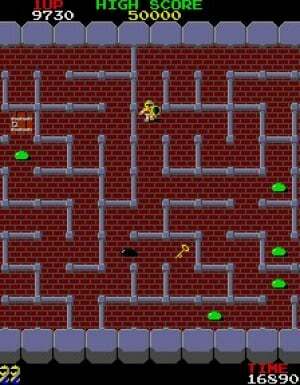 Each floor is quite literally a maze - Your objective on every single floor is to locate the key and then take it to the door leading to the next floor. Of course this isn't all there is to it, because every floor is swarming with enemies. When not pressing anything and just walking around, Gil will hold out his shield, used to block projectiles. If you hold an action button though, he will hold out his sword instead. It takes about a second to switch between the two, so you have to react very fast on floors with enemies that shoot stuff! Some enemies also have to be hit from a certain direction, which can be hard to do since you have almost no room to maneuver! A major element of the game is that every single floor has a hidden treasure - These can be unveiled by accomplishing certain tasks. Thankfully, unlike most of the game's features, none of these are random. 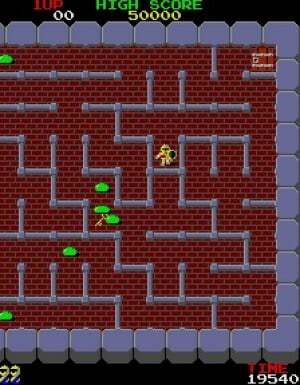 The first floor's task, for example, is always to kill three Green Slime enemies. This will always make a chest with a copper pickaxe appear, with which you can destroy one wall per stage, allowing you to get around much more quickly. Some of the later tasks are a bit more absurd though - On one of the earlier floors, the treasure chest appears by walking over the exit door before getting the key, something you're not likely to do without knowing. Some of these treasures are absolutely essential in beating the game, such as a pair of boots on the second floor which let you move much faster (You move painfully slow at the start of the game - Watch the video!) or an item which lets you see normally invisible enemies. The Virtual Console version's manual lists the requirements to get the first seven treasures, but after that, you're on your own! As you might expect the game is quite repetitive - Every single floor looks the same, the only thing that really changes on each one is the types of enemies and the requirement for the treasure. 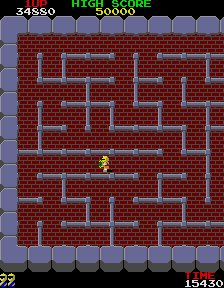 Although the maze is different on every floor, the size isn't, so generally that doesn't really make a difference either. Enduring all 60 floors takes a lot of effort and dedication. If you lose all lives, you have to hold the sword button while starting a new game in order to continue, allowing you to select any of the floors you reached in your previous go, and you keep all items. Doing this actually requires you to change the game options - The sword button is normally mapped to both 1 and 2 (On the Wii remote), but both of those are also used for inserting credits and starting, so if you try to continue this way it won't work since it will only register you starting the game, and not holding the sword button! Thus, if you want to continue, you have to unmap button 2 and map the sword to A or B. Quite annoying! Remember this, because you'll be dying a lot - The game wastes absolutely no time in upping the difficulty, because as early as floor 5, wizards and warlocks will appear all over the place shooting fire and other spells at you, requiring you to very quickly change direction to block every shot - While dealing with other enemies! If you start to run out of time the game will also start spawning Will O' Wisps - These are so fast you can't outrun them, so get out as fast as you can! You can only configure one option in the VC version - The amount of lives you get per credit. If you actually manage to make it to the last few floors you might be in for even more surprises - Some of the penultimate enemies can't be hit at all without certain powerups, and the final boss won't even show up unless you have the correct item! As said, the game has its fans - But unless you're willing to spend a ton of time truly mastering the game you're not likely to enjoy it a lot. This one is only really recommended for the truly sadistic gamers! From the video I watched of this, the small playing area on the VC version looks like it could be seriously detrimental to the playing experience. No thanks. Thats 4 and 0 for me out of the initial arcade releases. However, I think there is great potential for this department of the VC and I'm glad that the VC as a whole isn't being overlooked by Nintendo. I thought you were supposed to score it determined by your play experience, not score 'based on what most people would probably give it". Based on my experience it would've been a four as well - I meant that I understand that there's also people who enjoy the game, so if I should rate it with them in mind or not. I think very few people are going to be willing to spend the enormous amount of time it takes to "enjoy" the game, so I didn't. This isn't a very good game, people. If you can extract enjoyment from this then you're a better man than me. Personally speaking, I find hitting my head with a baseball bat is less painful than playing this. Just to let you all know- you can continue after a Game Over by holding down the attack button before pressing Start to try again. You'll continue from the last floor you got to. Ok, I did not know that - I didn't expect a secret continue command. It doesn't change the score though! Ewww... I remember this game from the numerous Namco collections. I spent most of my time screaming "Walk faster, damn it!" at the game. Well, not all of the arcade games on the Wii can be winners, I guess. This is a game on the Playstation Namco Museum that I didn't enjoy on first play and would play again periodically to remind myself why I didn't like it. Tower of Druaga is a moderately infamous arcade game. Just keep repeating to yourself, "Gilgamesh and Enkidu at Uruk". It will make the game better. Trust me. And if your eyes start glazing over, pretend you're on a new adventure by repeating "Darmok and Jalad at Tanagra". Nobody knows who those oddballs are or what the point of their adventure was, but it sounds like fun! Yeah, the review hit the nail on the head. I remember playing it on the Namco Museum (vol. 1 or 2) and wondering how it could be that this game was in a compilation for a home console, but even after the instructions I still couldn't figure out what to do! Even more bizarre to me that Namco keeps on referencing the game like it's some holy treasure decades later! It does in fact have a cult following! Despite the extreme amount of Guide Dang It moments, this game is fun. I was expecting a 3 for some reason. I agree with the review completely. If you're willing to put in the time to understand the game, you might like it. But for everyone else, this isn't going to be very appealing. Sounds like it'd only be fun if you had help from GameFAQs, lol. @ thewiirocks: "One of those RTFM-or-no-game-for-you games, eh?" Nope, that would require there being any wayof getting hints for stuff, which ther isn't. It all pure trial-and-error and watching better players demonstrate how to do stuff. It was designed for the arcade enviroment, and isn't quite as effective on a home system. Oh, and it's not "a bad game". It's "a game you probably won't like". There's a difference. The score works, I guess, this is a terribly hard game to rate, since it's so individual whether you'll enjoy it or not. Give it a try if you don't consider 5$ a massive loss if you don't end up liking the game. Ah yeah, and "On one of the earlier floors, the treasure chest appears by walking over the exit door before getting the key, something you're not likely to do without knowing." - if you keep playing for a while, you'll eventually start with the door placed in an area where you're likely to walk over it before going to the key (especially this early in the game, before powerful pickaxes are available). It's a treasure you're bound to eventually uncover - there are several later ones that are near-impossible to accidentally stumble over. I found it enjoyable. I would have given it a 6 or 7. I'm still thinking of giving both this and Starforce a try sometime. I'll come back with my thoughts if I do take the plunge. I love Mappy though on NMR. Worth a buy. @KnucklesSonic8: Star Force is definitely worth a punt. It's got that arcade flava. It should have had a continue mode like it did on Namco Museum for PSP. How many disappointments will VCA bring? Mappy is apparently the only good game, and it got a 7, even though 7s rule. I was curious about this game, but I guess that it's another failure. ^ Hey, don't call this a failure. True, it probably deserves that score, but at least try emulating it or playing it on a Namco collection. Tower of Druaga is one of those games everybody should try at least once. Especially those who have played Baten Kaitos. It's interesting to say the least. It's one of those games that, whether it's good or bad, is certainly a curiosity. It's got a cult following and a lot of people in Japan like it. It even inspired a Fushigi no Dungeon game on the PS2 (which received no praise as far as I've seen, but I've never played it and it's a $4 bargain bin game). Don't count on beating it though, and don't pay money for it unless you know you're a big fan. Namco won't really care since I doubt they expect it to sell well. Oh, and to the above posters. I'm going to play the negative card and say that Star Force is not definitely worth a punt. It is worth punting out a window, though. You can get it with Solomon's Key and Bomb Jack for about the same price, and those games rock. I don't think I ever got past the first freaking floor in this game on the PSP collection. Maybe not even the first enemy. It's THAT bad, at least to me. The complete and utter lack of ANY manual WHATSOEVER certainly couldn't have helped. Whatever the case, I fully agree with Ricardo91. Don't waste $5 on this turd if you don't have to. If you have a PSP (or any number of other systems upon which this game may be featured in a collection), just get the collection. VC Arcade is going to be a REALLY hard sell to me, partially because I was never an arcade rat (grew up with NES and SNES in my living room), and partially because so many arcade games are already on collections at a much less horrible value! Graphical header says "moderately popular", article says "moderately infamous". I'd go with the 2nd one. Not sure why they've released Namco's impossigame on VC when there are other better ones to be had. "You can only configure one option in the VC version - The amount of lives you get per credit." In all fairness, that is the only gameplay-related option on the arcade board, so not really any sort of criticism worth mentioning. 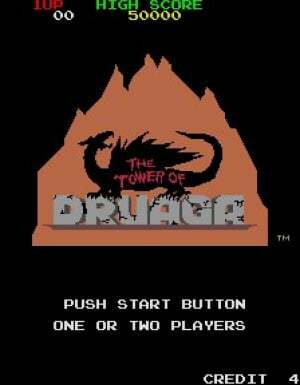 Just thought I'd share this- because I'm actually a fan of the game, I wrote a little bit about The Tower of Druaga on my own site (http://gaminghell.110mb.com/TheTowerOfDruaga.html). More importantly, at the bottom, I've scanned the really handy guide from the Namco Museum version of the game- you can get the guide online elsewhere, but this one's nice and compact. Might be handy for anyone brave enough to try and beat this thing. To keep this from just being a message shilling my website... Judging from the poor reaction the game's got, I sincerely hope we don't get the sequel, The Return of Ishtar- it's on the Japanese service already, but hopefully it won't get released here. 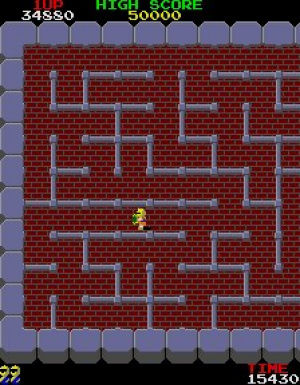 If you thought The Tower of Druaga was cruel, Return of Ishtar is practically impossible unless you make your own maps, and you need to control 2 characters at once!! I already have this on Namco Museum DS, i got the game for $20 and includes this, Pacman, Mappy, and like 5 other arcade games. This game and many other games of the day still have a following is right! these were games that really tested skill and still do unlike todays games that take no skill to play, (game faqs is trash) Watch the movie King of kong a fistsul of quarters and if you still think different then log onto www.twingalaxies.com,this is where the real gamers including myself hang out. I've always wanted to come back and say that this game isn't a "failure". I like it and that's all that matters. I'd give it at least a 7 myself. I keep going back to it. This is one of the hardest games I've ever played. I would give it a 2/10. The PS2 sequel stunk as well. I won't be buying this game. Namco should be ashamed. Namco should not be ashamed that they released this title. It let's people expierence this blast from the past. I 'm looking foward to them releasing The Return of Ishtar.THIS GAME IS NOT A "FAILURE". I'm just going to download it just to say "Thank you" to Namco for Releasing this game. I just wish more people appreciated this great game.